Yes, we've managed to create a black hole...or at least the optical equivalent of a black hole's extreme, light-trapping properties thanks to an ingenious combination of lasers and glass. Best of all, it offers proof of Stephen Hawking's famous radiation. Thankfully, there's no danger this particular black hole will get out of control and swallow up the planet (which is a very good thing, considering we even armed it with lasers). Instead, Italian scientists came up with a way to replicate the extreme gravitational warping inside the event horizon of a black hole by creating an analogous trap for light waves. It's not a precise match, but it's close enough that scientists can use it to study some of the aftereffects of matter's passage into a black hole. The researchers created their optical black hole by placing a crystal of pure glass in the path of a laser beam. Under normal circumstances, the laser light will pass through the glass without problems, but if the beam reaches a certain intensity it causes the atoms making up the glass to react and move slightly out of their natural positions. That changes the refractive index of the glass, which is the angle at which light is deflected from the glass as it passes back into the air. Here's where the glass starts to really imitate a black hole. The laser light sent out bursts every picosecond, or once every trillionth of a second, and each successive blast altered the refractive index again and again. This creates a tiny disturbance zone in the middle of the glass crystal where light is trapped and cannot move forward, much like how light cannot move against the gravitational tide of the event horizon of a black hole. This zone of trapped light has allowed the scientists to observe Hawking radiation for the first time. Proposed by Stephen Hawking back in the 1970s, Hawking radiation is thought to be the one material that can actually escape from a black hole. Quantum mechanics says it's possible for virtual pairs of a particle and its antimatter equivalent to suddenly pop into existence. In the intense energy fields around a black hole, there's actually enough energy to convert these virtual particles into real ones. When that happens, one particle might be able to zoom off away from the black hole, while its partner gets trapped. Those escaping particles are Hawking radiation, although we've never observed them in space and it's unlikely we'll ever get close enough to a real black hole to measure them directly. 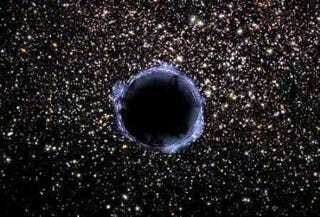 However, the disturbance zone of the optical black hole revealed exactly the physical processes Hawking predicted. Pairs of particles and antiparticles did indeed spring into existence, and half of the pair was able to escape the light wave trap while the other was left behind. The scientists say they have ruled out every other possible explanation for this phenomenon, and that it is indeed Hawking radiation. And this might just be the beginning of the usefulness of an artificial event horizon. Ulf Leonhardt, who first proposed this sort of thing a couple years ago, salutes the scientists for their achievement and says this might finally give us a way to test string theory and other theories that combine gravity and quantum mechanics.